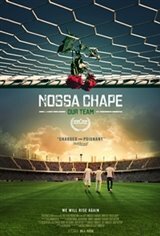 NOSSA CHAPE tracks the rebuilding of the Chapecoense football club in Brazil after a November 28, 2016 airplane crash left only three players alive. Through exclusive access to the families of the deceased, the new team and three severely injured recovering players, the documentary investigates the community's many challenges in the aftermath of tragedy. The town finds itself divided by a desire to respect the memory of those they lost while also preparing to move the club into its future. The citizens and team must find a way to unite around a common identity.